State delegates to the United Nations kick off negotiations on the Global Compact for Migration (Tuesday, 20 February 2018, New York City). Photograph courtesy of CELS.The first round of negotiations of the Global Compact for Migration was held last week in New York City. At the same time, states began to discuss a Global Compact on Refugees, which aims to make the 1951 Refugee Convention (signed in Geneva) and its protocols more effective. Both processes arise from a commitment made by United Nations member states in the New York Declaration of 2016. Together they represent an immense opportunity for the international community to address the challenges of human mobility in the twenty-first century. The Global Compact for Migration is undoubtedly the more novel political development of these two parallel processes. Since the 1950s, clear regulations and a specific institutional structure – the United Nations High Commissioner for Refugees (UNHCR) – have protected people on the move due to cultural, ethnic, political or social persecution. The Global Compact for Migration is undoubtedly the more novel political development of these two parallel processes. But the political commitment regarding other forms of international mobility has been absent. It took 13 years for the United Nations Convention on the Protection of the Rights of All Migrant Workers and Their Families (CMW) of 1990 to enter into force. With only 51 state parties, it is currently one of the United Nations treaties with the lowest number of ratifications. Furthermore, the international forums on migration carried out to date have been extremely precarious from an institutional perspective and have been disconnected from areas of decision-making; nor have they taken on board international human rights logic or standards. The Global Compact for Migration should outline concrete operational commitments for states to review the negative consequences of their migration policies (in accordance with paragraph 45 of the New York Declaration). It is, in this regard, an unparalleled initiative by the international community to establish a common agenda that covers all states, and an unprecedented opportunity to specify obligations in terms of protecting the human rights of migrants. This does not mean that no challenges lie ahead. The first draft of the Compact and the first round of negotiations reveal enormous differences between the realities of the distinct regions, generating a noisy debate in which very different conversations coexist and the willingness to move toward a truly global common approach is unclear. After the United States abandoned the process last December, there has been strong resistance among different actors such as the European Union to effectively reviewing their policies and practices, and little willingness to listen to and incorporate the views of the Global South – in particular, the lessons learned from the reforms carried out in Latin America that protect migrants’ rights. (For more information on concrete proposals based on these experiences, see our joint document Global compact on migration: Recommendations for a compact with a rights-based approach). During times of political inertia at the international level, national migration policies evolved in opposite directions in different regions. In Latin America since the end of the 1990s, countries like Argentina (which has had a stable migrant population of between 4% and 5% of the total population in recent decades) debated national laws that recognize almost all the same rights granted to national citizens for all migrant people – including economic and social rights – regardless of their immigration status. The Argentine migration law passed in 2003 introduced the world to the paradigm of the right to migrate. The regularization of migration, which is a necessary condition for migrants to exercise their rights, came to be understood as an obligation of the state and a right of migrants. The Argentine migration law passed in 2003 introduced the world to the paradigm of the right to migrate. Guarantees of access to justice and due process were created to protect against rights violations in deportation and expulsion proceedings. Detention for migration-related reasons became extremely exceptional, in terms both of the law and in practice. In subsequent years, this regulatory framework prompted other Latin American countries – such as Uruguay (2008), Bolivia (2013), Peru (2017), Ecuador (2017) and Brazil (2017) – to reform their migration laws in the same vein. Other countries, such as Chile, reviewed procedures and practices to resolve cases of irregular migration and statelessness, especially those involving migrant children. In Europe, the United States and Australia, however, restrictive policies and the militarization of borders have been intensified and made progressively more sophisticated in recent years. On the border between the United States and Mexico, migrants were forced to cross through desert areas, some of them disappeared, many others were detained at the border, subjected to summary judicial proceedings with their few belongings confiscated. In Europe, the possibilities of detention and expulsion were expanded, cooperation agreements were developed mainly with Africa to stop migration prior to arrival in European territory, and operations to intercept migrants at sea for their "return" to their countries of origin were consolidated. Despite the warnings of many human rights organizations about the impacts of these policies, in 2015 the world watched astounded as the unsustainable results of these measures unfolded, with unbearable consequences for migrants’ rights. That year more than 3,548 people were killed or disappeared when attempting to cross the Mediterranean Sea from Africa to Europe, including children who had survived brutal tragedies in their countries of origin. In 2015 the world watched astounded as the unsustainable results of these measures unfolded, with unbearable consequences for migrants’ rights. This humanitarian crisis revealed a pre-eminently political problem. That is the reason why, in December 2015, the UN General Assembly initiated the process that would lead to the adoption of the New York Declaration of 2016 and, later, to the negotiation of a Global Compact for Migration: " We are determined to save lives. Our challenge is above all moral and humanitarian. Equally, we are determined to find long-term and sustainable solutions” (New York Declaration, 2016, paragraph 10). Forging a shared global agenda for migration is an urgent task. The current situation – which forces people to risk their lives to seek better opportunities in another country and keeps them in an irregular situation for several years, denying them any possibility of effective integration and fueling stigmatization and intolerance – is unsustainable. On February 5, Mexico and Switzerland, the negotiations’ co-facilitators, presented the zero draft of the Global Compact. The text surprised different actors in a positive manner. The format, which focused on objectives and practical measures, incorporated a human rights perspective (although with pending challenges) referring to the need to agree on measures that remove obstacles to migrants living a decent life and migration contributing to economic and social development. Several specific points in the document are worth highlighting: for example, the concrete commitment to offering legal assistance and guaranteeing access to justice for migrants in any judicial proceedings that affect them (Objective 7.f); ending the practice that links work visas to a single employer (Objective 6.h); ending the practice of detention of migrant children (Objective 13.g); as well as other measures that represent guarantees against human rights violations. To surmount the current situation, countries must realistically address the national policies and international cooperation models developed to date. The excellent joint intervention of Argentina, Brazil, Chile, Colombia, Costa Rica, Dominican Republic, Ecuador, El Salvador, Guatemala, Honduras, Nicaragua, Panama, Paraguay, Peru and Uruguay during the first morning of negotiations showed that an approach based on concrete policies that protect rights is viable. However, the strong statements contrary to this perspective made by European Union countries and other important actors show that the priority of the Global North is to keep things as they are, or return to debates about the distinction between regular and irregular migrants with regard to rights, raising serious doubts as to whether states will be able to reach a productive consensus. The priority of the Global North is to keep things as they are, or return to debates about the distinction between regular and irregular migrants with regard to rights, raising serious doubts as to whether states will be able to reach a productive consensus. There is also concern about the poorly articulated position between the countries of Latin America and those of Asia and Africa, whose nationals are the main victims of discriminatory policies that criminalize migrants. States must ensure that the Compact overcomes the priority focus on regular entry channels and return policies, and covers an issue that is essential if migration is to be addressed with honesty: migrants who already are, and will remain, in their territories. The existence of people in an irregular migratory situation is one of the greatest challenges in terms of access to rights, social integration and non-discrimination. The profile of migrants who remain in an irregular situation reflects the racial and economic selectivity of migration policies, and their irregular situation reinforces pre-existing inequalities by promoting differentiated access to services such as health, education and housing. Although the zero draft contains a specific action that summarizes the importance of migratory regularization procedures (objective 16.g), it also includes other elements that generate doubts about its coherence and the possibilities of effective implementation of the action. Nor does the draft delve into how this action would be implemented, that is, what type of procedures and what criteria would be used. On the one hand, it refers to the commitment to provide "documentation" to migrants to guarantee that they have proof of legal existence and can access services and rights. This language conflates different concepts, since, although regularization implies documentation, providing documentation does not necessarily imply migratory regularization. An identity card is not the same as a legal permit to reside in the country. An identity card is not the same as a legal permit to reside in the country. In addition, the draft calls for strengthening procedures and mechanisms for determining status and, in reference to the application of asylum treaties, stipulates that these procedures should "clearly differentiate the migrant from the refugee." The text insists on a binary distinction that does not reflect the migratory reality, or the wide range of regularization alternatives (understood as a residency permit), ranging from residency for work purposes or family reunification to asylum, passing through humanitarian residencies, which could be linked to different durations of stay. Nor are these criteria developed elsewhere in the document. The use of detention for migratory reasons and the systematic and arbitrary use of mechanisms to deport migrants not only make them vulnerable to different forms of institutional violence, but also fosters symbolic criminalization, xenophobia and racism, contributing to migrants’ social exclusion. In that regard, it is worrisome that a whole chapter of the zero draft has been devoted to "returns” and “voluntary returns", while there is no commitment proposed in relation to the compulsory return of migrants, that is, to expulsion and deportation. There is no commitment proposed in relation to the compulsory return of migrants, that is, to expulsion and deportation. An approach focused on migrants already residing in a given territory should contemplate human rights criteria for deportation rulings, covering not only the principle of non-refoulement that derives from the Convention against Torture, but also criteria to protect a child’s best interests, family unity, community roots or the years of residency in a country, as well as humanitarian protection. In addition, these procedures should be based on the principles of due process and access to justice, ensuring migrants the necessary guarantees against measures that may have an enormous impact on their freedom. At the same time, the chapter on detention must incorporate more clearly the principle of non-regression on rights guarantees, not only so that the closure of existing detention centers and a reduction in the number of people detained for migration-related reasons are established as a political horizon, but also so that states that do not use detention as a migration policy (applying it only in exceptional cases linked to the execution of final expulsion orders) commit to not using it that way in the future. 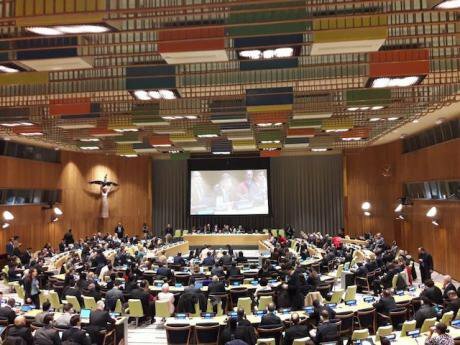 It is essential that the debates during the second round of negotiations of the Global Compact enable progress on resolving these points of discussion, which have concrete consequences for migratory policies and for the lives of migrants. The insistence on the idea of sovereignty and border control has only produced segregation and violence. The time has come for a paradigm shift. 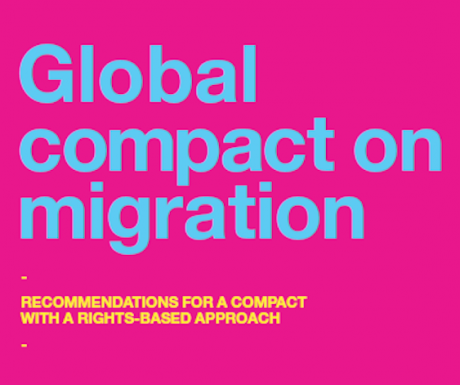 See the Global Compact on Migration: Recommendations for a compact with a rights-based approach.